Agricultural Economic Insights Got Enough Base? As the possibility of 2014 farm program payments slowly works its way toward reality, we thought it would be useful to look at one of the major drivers of how large these payments will be, farm program base acres. The ARC-County and PLC programs both pay farmers on 85% of their base acres, while ARC-Individual pays on 65% of base acres. According to USDA payments will be made at the end of the marketing year for the commodity in question, but not before October 1, 2015. One key feature of the new farm bill is that payments under ARC-County and PLC do not depend upon what was actually planted for the growing season. While current prices (ARC-CO and PLC) and yields (ARC-CO) are the most important triggers for farm bill payments, base acres rather than planted acres determine the total payment that a farmer receives. Most of the discussion around payments has been at the level of payment per base acre. The concept of a “base acre” sounds fairly intuitive, but we wanted to know how well base acres lined up with planted acres and whether producers might be disappointed when, or if, a farm bill payment is made. Base acres have played a key role in determining farm program payments for a long time. However, if you have ever looked a farm’s base acres and compared them to planted acres you will notice some discrepancies. These are a result of various programs that allowed farmers to establish and reallocate base acres over the years. Depending upon their individual situation, farms can have more or less base acres relative to planted acres. It is important to remember that base, not planted acres, determine the total farm payment. The 2014 farm bill allowed farmers to reallocate base acres in proportion to what they had planted on their farms during the time period of 2009-2012. This publication by Kansas State describes the details and some history about base acres and reallocation. According to the USDA, there is a combined 215 million acres of corn, soybean, and wheat base in the United States. Iowa farmers hold the most corn base at 15.6 million acres and the most combined corn, soybean, and wheat base acres at 22.4 million acres. Illinois leads the nation in soybean base at 7.1 million acres and Kansas has the largest wheat base at 10.4 million acres. In 2014 the U.S. planted 231 million acres of corn, soybeans, and wheat, so base acres were about 93% of total planted acres. Figure 1 shows the ratio of total corn, soybean, and wheat base acres to 2014 planted acres of those crops for the 15 states with the largest acreages of these crops. The states are arranged from those that planted the most acres of these crops to the least. The results for all states are shown in the map below figure 1. You can also view separate maps for corn, soybeans, and wheat. One can see that like the U.S. total, most states have slightly fewer base acres than they have planted acres of these crops. For instance, Iowa has a total base equivalent to 95% of their 2014 plantings of these crops. The lowest proportion of base acres can be found in Wisconsin at 82% and the highest in Oklahoma at 118% of total planted acres. 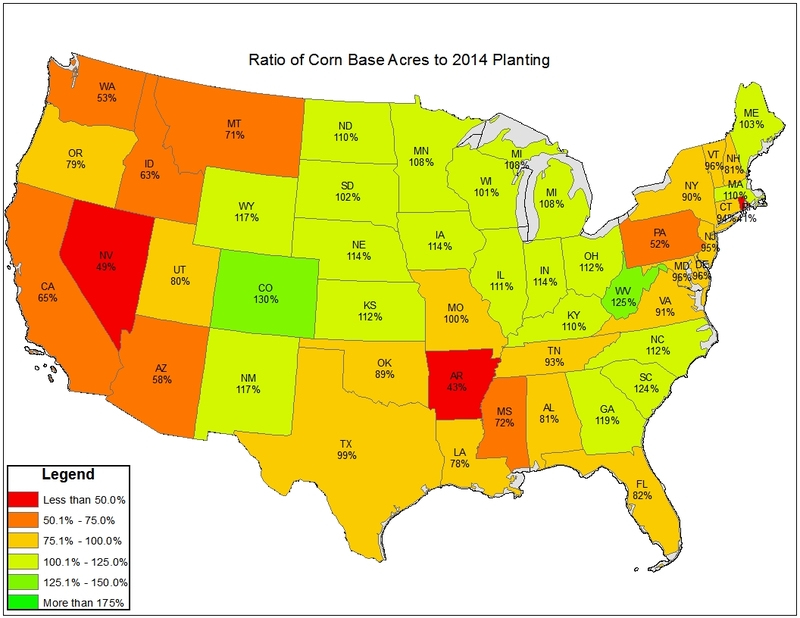 Of the 15 states shown in Figure 1, 7 have bases of 95% to 100% of 2014 planted acreage, 4 have base less than 90% of total plantings, and 3 are above 110% of total plantings. Some states like Texas likely have significant amounts of generic base acreage which we did not include in this analysis. The updated base acres reflect a number of changes across the country. Prior to updating base acres, North Dakota actually boasted the largest wheat base acreage in the country. After the update, Kansas holds that title, and it isn’t because Kansan’s actually increased wheat base acres. In fact, they decreased them by 1.7 million acres. It’s just that North Dakota farmers elected to reduce wheat base by a staggering 3.6 million acres as they shifted toward corn and soybeans. This is not surprising given the shift in corn and soybean acreages in that state and region. In total, this general trend played out in base acre reallocation, farmers shifted acres from wheat to other crops, primarily corn and soybeans. Figure 2 shows the percentage change in corn, soybean, and wheat base acreage allocations for the 15 states with the largest combined corn, soybean, and wheat base. North Dakota is likely the largest winner in the reallocation of the acres as its farmers were able to add significant amounts of corn and soybean base acres. Wheat base dropped considerably across the U.S. The new ARC-PLC wheat base is nearly 10 million acres smaller than under the previous program. Other large acreage declines were seen in barley (3.5 million), grain sorghum (2.6 million), and oats (0.95 million). Corn acres were likely the beneficiary of many of these acres, increasing by 12.8 million acres. Soybean acres increased by 4.7 million acres. However, because Figure 2 is on a percentage basis, it obscures the magnitude of the acreage shifts in other states as well. Iowa has a large amount of base acres and relatively few wheat acres to shift away, so it appears its farmers moved acres from soybeans. In doing so they added 1 million acres of corn base, and reduced soybean base by 691 thousand acres. Figure 2. Percentage change in Corn, Soybean, and Wheat ARC/PLC Base Acres versus DCP Base Acres. To put the base acre reallocation and shift to corn acreage in perspective, after updating, total U.S. corn base acres stand at 96 million acres, more acres of that crop than have been planted in any year except 2012 when 97 million acres were planted. Figure 3 shows the ratio of updated base acres to the 2014 planted acres of corn, soybeans, and wheat. Ratios greater than 100% indicate that the state has more base acres of a commodity than were planted in 2014. For instance, base acres of wheat in Iowa were 200% of the actual 2014 plantings of the crop in that state. Twelve of the 15 states shown now have at least as many corn base acres as were planted in 2014. 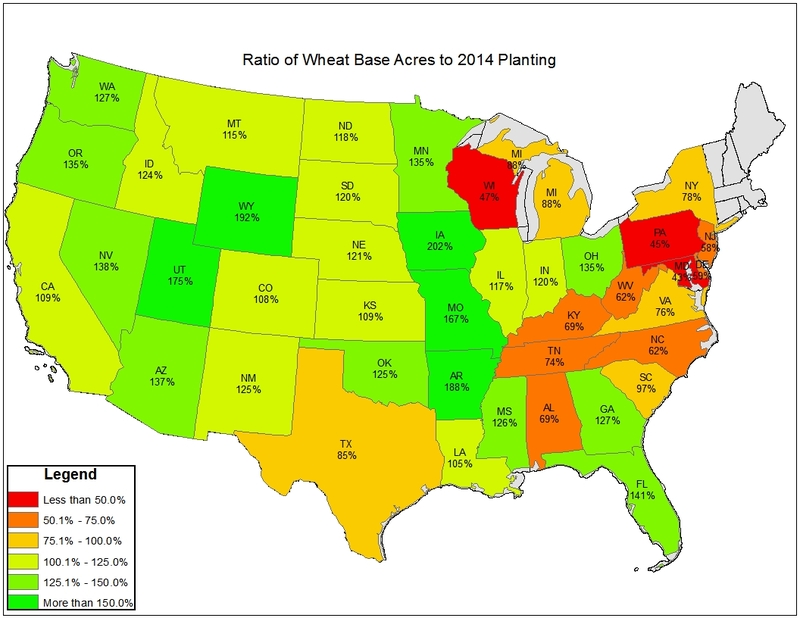 Similarly, wheat base exceeds 2014 plantings in all but 2 states. On the other hand soybean acres are significantly below 2014 plantings in every state. Figure 3. 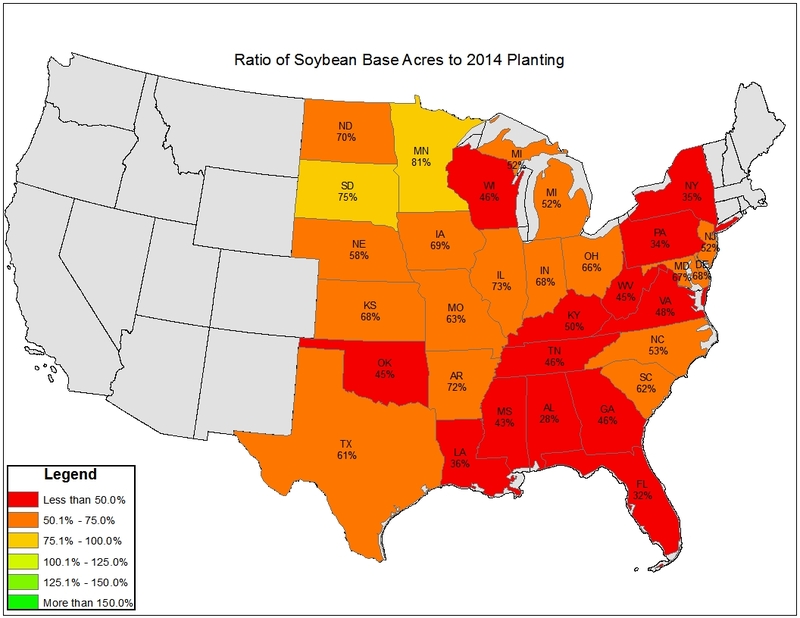 Ratio of 2014 Planted Acres of Corn, Soybeans, and Wheat to Updated Base Acres, Selected States. In previous posts we’ve pointed out some of the challenges of the current farm bill being used as a risk management tool. The use of base acres create two additional disconnects between reality and the payment mechanism thereby influencing the farm bill’s ability to help producer’s manage risk. The first disconnect is in the allocation of corn, soybean, and wheat acres. In general, base acres are over representative of corn and wheat acres while under representative of soybean acres. In the initial years of the farm program it appears that corn base may pay more than soybeans and wheat acres, so for farms with lots of corn base may benefit. From a risk management perspective, the second and more concerning challenge with base acres, is that total base acres do not have a consistent relationship with total planted acres. In Missouri, for example, producers will be eligible for payments on only 72% of corn, soybean, and wheat acres planted in 2014 (85% of base acres are paid and base acres are 85% of planted acres in 2014). On the other hand, producers in Oklahoma can expect potential payments based on 100% of acres planted in 2014 (85% of base acres; base acres are 118% of planted acres in 2014). And these are the variations at the state-level only. Variations at the farm and field level will also exist and are likely more dramatic. This creates a safety net and assistance level that is highly variable across producers and regions. Producers should carefully consider and check their unique gap between planted and base acres and recognize their potential payments this fall might be less than expected. Some, unfortunately, might find themselves disappointed in the level of risk management coverage that their farm bill program provides.